Have you done a thorough inspection your property recently? What would your first impression be at a glance? When others look at it, especially tenants and customers they not only glance at the place, they actually interact with a variety of the property’s elements. They judge the property based on it’s cleanliness (or lack thereof) and they are generally hard on properties that look dingy. People don’t want to work in (or shop at) properties that don’t look good, so when someone has the impression that a property is not clean, they may want to work or shop elsewhere. Some may even take to the internet to leave a bad review. This is a most unwelcome circumstance. Could these be the consequences of a property that doesn’t look clean? The important thing to remember is that first impressions cannot be changed and negative impressions are lasting. The ideal outcome is to create a positive impression on potential tenants and shoppers. Also, if your property isn’t clean, neighbors may also complain. They don’t want to live near a dirty property and you don’t want to be have to deal with their negative feedback. This can be avoided by regular maintenance and an investment in a power washing project by trained professionals. It’s actually a small investment that will not only save you the stress of hearing complaints, but it could potentially bring more confident customers and tenants too. More customers and tenants can follow because when people find something they like, they will tell others about it. It’s amazing how striking the appearance of a shopping center or property looks once it undergoes a good cleaning. Because a project of this nature can be complicated, professionals can help get the job done right. C & L Services has been in business since 1971 providing experienced professionals that can handle even the toughest power washing jobs. C & L offers environment-friendly flat surface and wand pressure washing that will give your property a fresh, clean look. This is the most important part of the project, communicating to tenants, shoppers, employees, and all affected parties. Communicating the cleaning schedule and informing them what they can do to stay safe is one of the most critical (and sadly missed) elements of the power washing project. 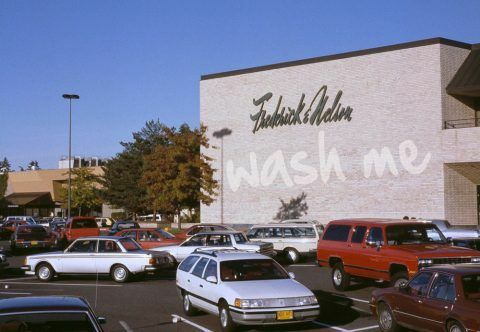 Are you a Shopping Center owner or manager looking for skilled power washing experts? C & L Services is a third generation family owned property maintenance company. We have been providing property maintenance services to real estate developers, commercial property owners and communities in New Jersey for over forty years. Our services also include parking lot sweeping, pavement maintenance, garage scrubbing, and asphalt repairs. We can give your property the attention needs and keep your tenants happy. If you’re in North Jersey, Contact us at 908-730-7884. If you’re in Central New Jersey call us at 732-886-1940 to arrange for shopping center power washing. Power washing the buildings in a community is like feeding a large group of people. This may seem like a strange analogy, but let me continue. For example, what would you do if you were selected to create an event where you had to feed 1000 people? You would probably gather a team of experts chefs, food preparation specialists, and service people. Then you would plan the menu, gather all the ingredients, prepare the food, and coordinate the service. You realize that it would take a decent of planning, preparation and execution to guarantee an enjoyable event. The process you would use to feed a lot of people is the same process you should use for power washing a large number of homes. Power Washing for Homeowners Associations – It’s Just Water Isn’t It? Many people see pictures of maintenance personnel power washing the exterior walls of the building. It looks pretty simple doesn’t it? Just fill up tank full of water, attach it to a power washing tool, and spray away. What people don’t see is all the planning, preparation, and practice that has gone into that power washing picture. Before spraying a single drop of water on a building you have to know how many buildings, what size buildings, where to park your power washer (it’s probably going to be a big one), when you need to start, when you need to end, how many skilled people you need to get the job done within the time allotted. You also have to consider safety issues such as being careful not to power wash off important pieces of the building, not to power wash into somebody’s open window (car or house) and what to do if you encounter something unexpected. Examples of unexpected situations include pulling into the community to set up the power washing job only to find one of the parking lots blocked by a large moving van loading or unloading for a resident. Or finding that either water or electricity are not available that day because of utility work . Yes we’ve encountered these both of these unexpected obstacles. Before firing up that power washer, you have to know how much water you need, how fast you’ll use it, and how much cleaning solution you’ll need for the water. You also have to know the capacity of the water tank , the skill level of your personnel, the age and mechanical condition of the power washing unit. And have we mentioned communication? You’ll need to let any and all affected parties know about the power washing project well in advance of the power washing project date? The communication preparation is probably the most important part of the power washing project. It is also ironic that the communication aspect of most projects gets the least attention and yet causes the most problems! Referring back to the food preparation analogy we used at the start of this article, if you have knowledgeable, skilled personnel who are included in creating the plan and committed workers who are committed to making sure that everything goes smoothly, you end up having a very satisfactory event. This is the same with power washing. With the right planning, preparation, knowledge, and skill, a Homeowners Association power washing project will go smoothly and have a great outcome. That is, clean buildings, happy residents that have not been inconvenienced, and homeowners Association dollars are being well spent . Are you a homeowner Association looking for skilled power washing experts? Our services also include community sweeping, pavement maintenance, seal coating, and line striping. We can give your property the attention needs and keep your residents happy. If you’re in North Jersey, Contact us at 908-730-7884. 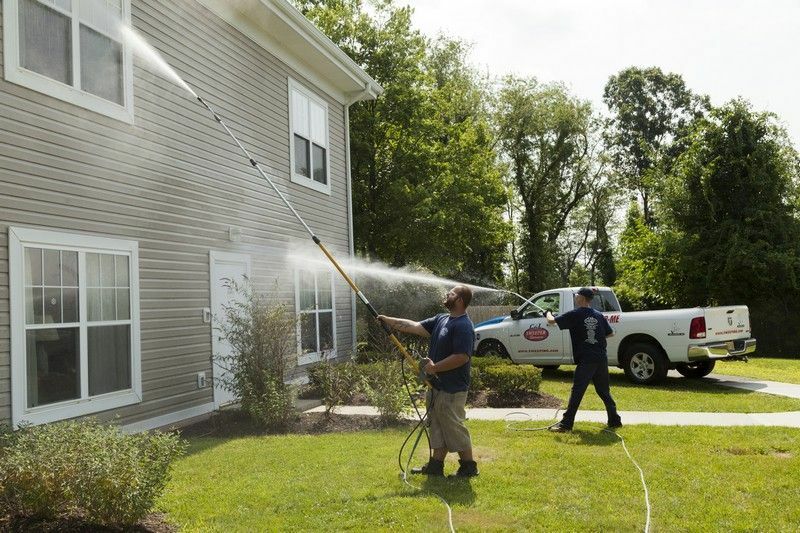 If you’re in Central New Jersey call us at 732-886-1940 to arrange for HOA power washing. Power Washing – Is It Time to Clean Your Building? Is your building looking fresh clean and attractive? Over time, a building’s exterior develops a coating of dirt, dust and pollutants. If this builds up over a long period, the building can begin to look quite dingy. Unfortunately, tenants and customers tend to judge (and quite harshly). So dim grungy buildings create a negative impression. Is the nice white marble Starting to turn grey? Is that crisp, red Brick now a dull maroon? These Are indicators that it’s Time for Power washing. Are there areas where dirt, dust, or pollutants have built up? Mold and mildew can collect on buildings and damage or discolor the exterior. Power washing is both the remedy and a good preventative measure for potential repairs or discoloration. In addition, mold and mildew may present health problems for building tenants and their customers. Power washing strips away these potential irritants and improve the health and safety aspects of your property. Determine if there are some sensitive areas that could be damaged from the high speed stream of water, such as generated by the power washing, cover them with plastic. These areas include decorative Roofing, decorative Fypon or sunburst, or smaller decorative items on the exterior. Although these exterior areas are already subject to exterior weather, power washing creates a very powerful stream of water that these elements are not designed for. Also contact a professional maintenance company who has the experience and equipment to do the job safely, effectively, and thoroughly. A top-notch service will save you time by conducting the inspection and making recommendations about what needs attention and what needs protection. C & L Services is a third generation family owned property maintenance company. 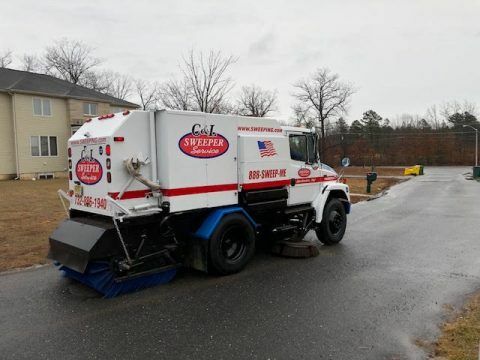 We have been providing pavement maintenance services to real estate developers, commercial property owners and communities in New Jersey for over forty years. We can give your buildings, sidewalks, walkways, parking lots, parking garages, warehouse and dumpster areas a fresh look with hot water or steam pressure cleanings. If you’re in North Jersey, Contact us at 908-730-7884. If you’re in Central New Jersey call us at 732-886-1940 to arrange for commercial power washing. Power Washing – Does Size Matter? Power Washing – Are Larger Projects Better? Our society likes big things, for example, big cars, big boats, big movies (with lots of load explosions!). The general public often thinks that bigger means better. You’ve heard the saying, “go big or go home”. Businesses use this saying to imply that it’s better to make big commitments than offer a half hearted effort. But going “big” is not always the most effective approach. Unfortunately, there are many circumstances where bigger is not always better. Think about big mistakes or big decisions gone bad. These big things are not always welcome. When it comes to power washing, the size of the project is not as important as careful preparation and skillful execution. The bigger the power washing project, the more time is needed for careful preparation. Flawless execution is also required, however, it much easier to accomplish when the right people are doing the right things according to plan. This is why the success of power washing projects is measured by scope, not size. The power washing project that involves a stand alone conference center has a smaller scope than power washing the homes in a 240 unit residential community. It is especially important to spend time walking a property, talking with affected property users (notice I don’t say property owners…although they are important too) and identifying the logistics of the project. Who is in charge of the project? What is the scope of their authority (full, partial, advisory)? What is the size of the property? Whats the total square footage of area to be cleaned? Who needs to receive communications? About what? How often? Who is responsible to communicate? What are the specific responsibilities for project executions? Who is going to do what and when? What are the safety requirements? For the property, property users and workers? How many workers are needed? What is the breakdown of workgroups and supervisors for the project? What materials are needed? How much? When are they needed? Who is in charge of ordering, storing and maintaining material? What equipment is needed? How many? When are they needed? Who is in charge of ordering, storing and maintaining equipment? How much time is allotted for project completion? What is the deadline? What are the contingencies for weather. materials or equipment delays? What are the contingencies for weather, materials or equipment delays? Who needs to receive communications about unforeseen circumstances? Who is responsible to communicate? Where will materials and equipment be stored before the project? During the project? How will materials and equipment be handled during the project? How will safety be monitored during the project? How will safety violations be handled? By whom? Who will conduct the final inspection? What will evidence project completion? How will final inspections be communicated? To whom? Who is responsible to communicate? What follow-up will be conducted to ensure client satisfaction? Who needs to receive followup communications? Who is responsible to communicate? As you can see from the scope questions, successful power washing project execution is based on careful planning and consistent communication. Do you have a large power washing project on the horizon? Looking for advice on power washing? Not sure about the need for power washing? Give us a call at 732-886-1940, we’ll give the facts you need for effective, efficient power washing. Commercial Property Maintenance – What is the Purpose? Effective property maintenance requires various processes ranging from simple day-to-day cleaning and repairs to replacing sections of the buildings, entries and parking lots. In order to restore your business premises to its most appealing presence, start with a full inspection of the property and analysis of any visual wear and tear or damage. Particular attention is needed in high traffic areas (either foot or vehicle) to identify and eliminate hazardous conditions. Property maintenance – Why is it important? Deficiencies in property maintenance can generate legal cost far greater than the cost of consistent maintenance. Cracks in concrete cause people to trip and fall. Potholes in parking lot pavement can be a nuisance to drivers and cyclists. Aside from safety, there are a number of other reasons why it is important that maintenance issues are fixed properly and in a timely manner. Most commercial property owners understand that when it comes to businesses and potential customers, you only get one chance to make a good first impression. Therefore, continuous property maintenance in your place of business keeps the grounds and buildings looking clean, fresh, and in good repair. This is an excellent way to create a lasting positive first impression on customers and tenants. Considering that the parking area, the pavement, and the entries are the first places customers see when entering your business, keeping them in a tip-top condition is a great way to convey a message of responsibility, attention to detail, and concern for safety. A commercial property is a very large investment you made to provide value to tenants, clients, and to you as the property owner. The best decision you can make today is to keep such a high-cost and long-term asset in good repair and looking good to project its actual value to everyone who uses it. Responsible property owners and managers schedule a regular thorough inspection of interiors and exteriors. 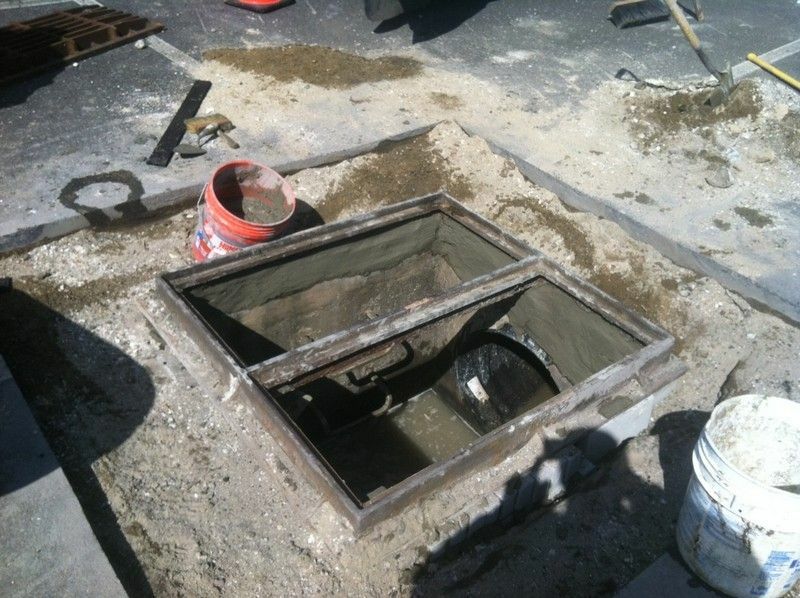 This is in addition to the traditional maintenance services such as portering (trash removal), filling cracks in pavement and walkways, sweeping, cleaning, pothole repair, and line stripping. If you have heard and understood the phrase “don’t be penny wise and pound foolish”, you already know that it is wiser to spend a small amount of money over time to preserve and protect a property rather than a large expenditure when some element of the property fails prematurely. When you notice a lifted shingle, cracked seam or damaged siding, it is a sign to get it fixed before it turns into a water intrusion issue, which if not fixed, will grow into stained, moldy, unsightly issue that will cost far more than the initial fix. When it comes to pavements or walkways, if you notice a small crack, it is a sign that you need to get it fixed before it turns into a pothole or trip hazard, which if not fixed, will metamorphose into a crate that will cost you a fortune to repair (or a legal issue which will cost both money and time). Potholes and cracks are easy and cheap to fix and it is a good a business decision to have a small budget for such an eventuality rather than wait to replace several yards of pavement or concrete in the long run. The term “property maintenance” can mean different things to different business and property owners. What is important is to understand what measures you must put in place to ensure that large repairs are minimized or prevented before they happen. Here’s a link to some of our other related property maintenance articles. After the chill and sogginess of winter, it is exciting to welcome the warmth and growth of spring. Warm weather means that you can go outside, enjoy the sun, and possibly get that tan. As you move outdoors, you will no doubt want your home, deck, patios, and fences looking great. This is where power washing comes in. Power washing can help you get your property looking clean, neat and great shape for entertaining (or attracting new tenants). Springtime is actually the best time to power wash your property. The warm weather means that you can inspect the property, and identify all the areas which need to be repaired, fixed, and cleaned. A wet, sloppy winter typically leaves a property in a desperate need of cleaning. Winter leaves a buildup of dirt, salt, and potentially moldy areas in buildings, walkways, and fences. This can leave the property looking dreary and dingy – an appearance which degrades the value of the property. Beyond the looks, potential mold buildup can escalate in the warmth of spring and compromise the exterior materials of the property. Basically, power washing in spring doesn’t just restore a fresh and neat look. It also stops a spread of mold, which increases the longevity of the building. And restoring the neatness and longevity of the property ultimately improves its market value. Therefore, you’re making an investment in longevity by having your property power washed in the spring. To take the first step towards this investment, find a power washing company whose services can help to restore your property to its best appearance. First, they have an experienced team that know how to eliminate the dirt, salt and mold that built up during the winter. The best companies should share thei plan on how they will eliminate the different kinds of dirt around your property. Second, they should use detergents which clear mold and prevent them from returning. The simple fact is that merely washing away the mold doesn’t kill them. In fact, the water can cause the spores to simply spread, thereby leading to a greater infestation in the property. The best power cleaning companies use detergents which remove mold spores during the power washing process. Third, they should have the equipment and techniques for cleaning different parts of a building. Different parts of a building such as walls, ceilings, patios, walkways and fences require different power washing approaches. Using the wrong appraoch on different surfaces can actually cause damage. Finally, their team of professionals should have experience provide cleaning services on a variety of different properties, from small scale residential/commercial properties to multi-story commercial buildings. This not only gives you confidence that you will get the best quality service possible, it also assures you that you aren’t letting a “fly-by-night” contractor onto your property. One company which guarantees all these and more is C & L Services. With a track record of providing high-quality power washing services, C & L Services can leave your property looking brand new. C & L Services also has specialized equipment for cleaning the hard to reach areas. Above all, the company offers some of the most affordable rates on the market. If you want your property restored to an “almost new” condition, call C & L Services at 732-886-1940. 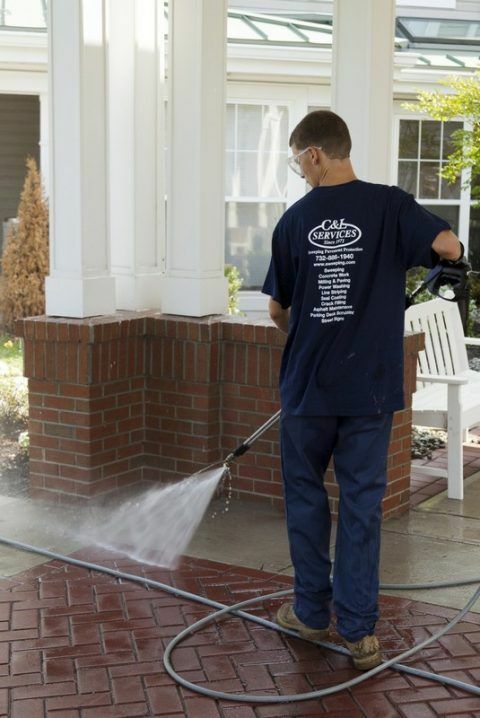 We’ll get your property looking fresh and clean through expert, affordable power washing. Powerwashing – What is the purpose? 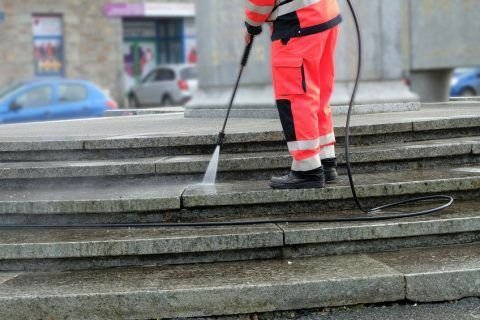 Powerwashing has become one of the most preferred techniques for cleaning properties. Many domestic and commercial property owners and property managers have made this technique a core part of their property maintenance schedule. Some, though, still wonder why it is relevant. If you question the value of powerwashing, this article is for you. Read on to discover the primary purpose behind powerwashing (also known as pressure washing). 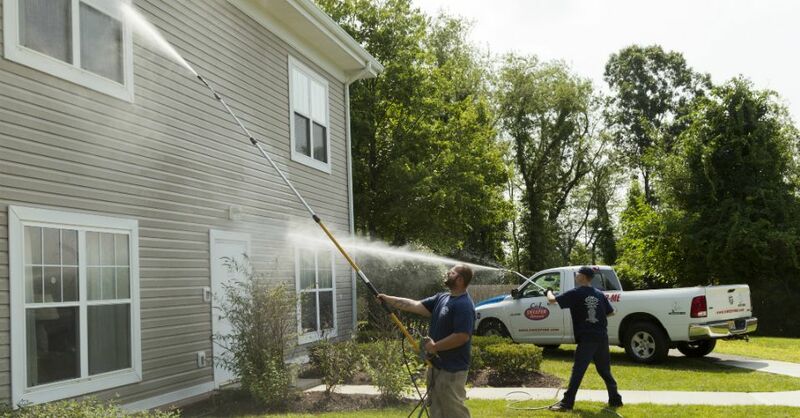 In other words, here is why power washing properties on a regular schedule is a smart move for property owners or managers. Powerwashing keeps properties looking spotlessly clean. This is because it “powers off” dirt from building surfaces and floors. This type of deep cleaning removes dirt including the type that attracts molds, removes grime, mud, loose paint, and restores a new look to the cleaned surface. The areas which benefit most by pressure washing include front entries, walkways, patios, fencing, pavements and even parking lots. Basically anywhere the general public hs a good view of the property. Powerwashing such areas ensure that the property looks presentable and creates a good first impression. This is particularly important for commercial properties where a good first impression can impact the businesses operating within the premises. Powerwashing is also critical for protecting buildings from the damage caused by molds. Mold infestation can damage surfaces made of wood or EIFS wall insulation (very relevant in commercial shopping centers and offices building today). Mold can cause these surfaces to decompose, causing water intrusion in buildings. Molds can also damage exterior painted signs or building decorations. By eliminating mold from wall surfaces, pressure washing plays a critical role in preserving buildings. This not only increases the lifespan of buildings, it also reduces the frequency of repairs. Powerwashing improves the safety of buildings in two ways. First, it eliminates surface dirt which can create fall hazards. The existence of molds on pedestrian walkways or car oils on parking lots can make the surfaces slippery and thus increase the risk of falls. Powerwashing removes mold and oils from surfaces and therefore makes them safer. 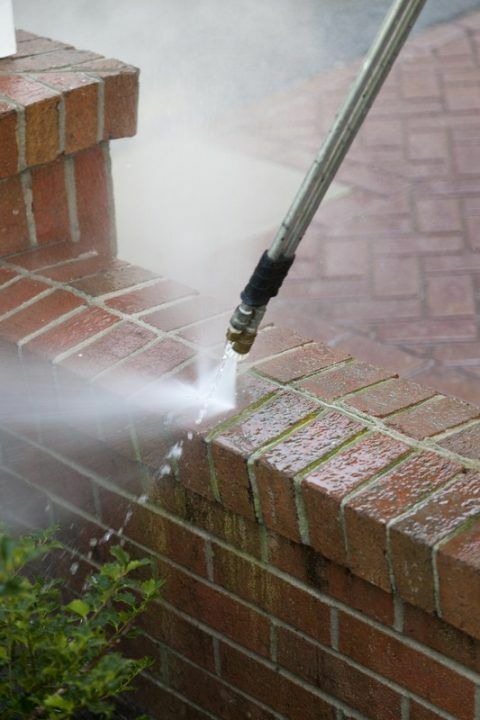 Secondly, powerwashing removes allergens and breeding grounds for disease-causing contaminants from wall surfaces. Mentioned in the previous paragraph is mold. Some people are allergic to the spores released by molds. Similarly, mold spores can trigger attacks in people who suffer from asthma. Mold and other surface residues, if left unchecked, can attract potential pests. These pests can carry disease. 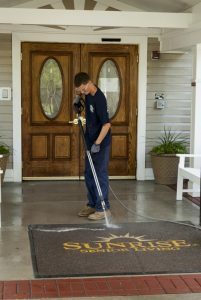 By removing mold and other kinds of dirt from surfaces, pressure washing protects people who reside or regularly use from the health risks associated with the mold spores or insects. Powerwashing ultimately saves on the costs associated with property maintenance. For starters, it reduces the frequency of repairs by preserving properties from the damage caused by mold and other contaminants. 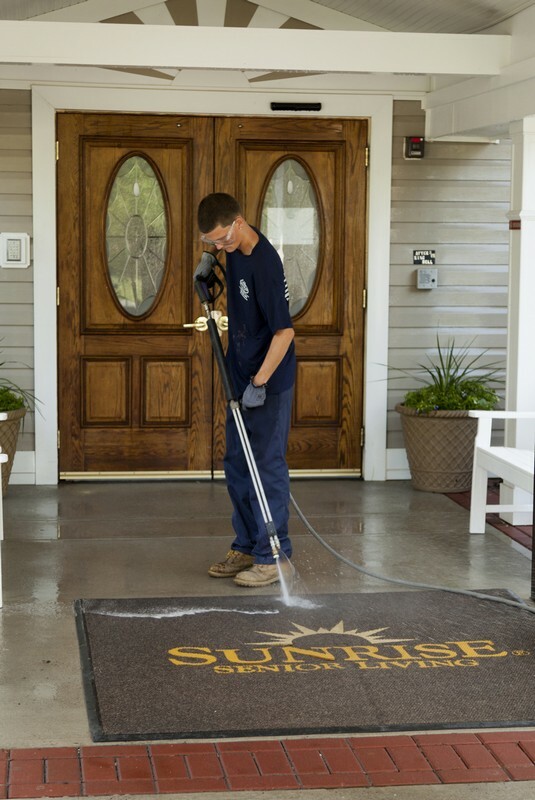 By eliminating fall hazards from walkable surfaces (see “Safety” above), pressure washing can minimize the insurance and legal costs associated with accidents occurring on the property. Ultimately, powerwashing is an investment anyone can make in maintaining their property. It improves appearance, preserves the property, increases safety and minimizes costs. The best part is that it can achieve all these things while having a positive impact on the environment – since the materials and detergents used are usually eco-friendly. 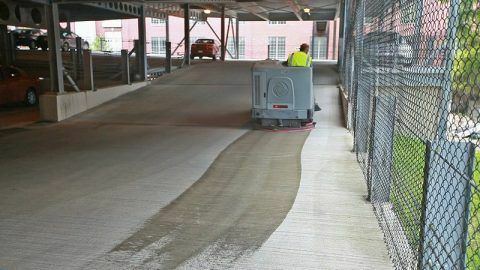 If you are a property owner or manager, think about adopting powerwashing as part of your property maintenance schedule. Your first step is to find a company which can provide you with services which are tailored to your needs. Give us a call at 732-886-1940. We provide these services and we’re known for prompt, reliable and budget friendly powerwashing. The reason we have to see the dentist every so often, even when our teeth are just fine, is to prevent painful problems with our teeth. Any dentist, or physician for that matter, advise patients to go for regular checkups. They know that waiting to treat health problems until they arise can cause the patient pain and huge treatment costs. This truism that works well with our physical health is just as true when it comes to property maintenance. If you care about the value of your property, you should give it the same treatment you give your personal health – regular inspections and immediate repair of trouble areas as soon as signs of wear or damage show. The sooner a maintenance issue is tackled, the easier and cheaper it is to prevent further costly repair. Scheduling regular inspection of your property is the ideal way to identify the repair or maintenance required before small problems become big issues that cost a lot more to fix. Small problems such as cracks and minor damage can deteriorate very quickly unless they are discovered and fixed timely. When a property maintenance contractor inspects a property, he or she will be better informed regarding any preventive maintenance steps required to improve the safety or the value of the property. Recurring problems that may have been fixed in the past should also be inspected to determine whether solutions applied were effective or not. According to the American Society for Quality (ASQ), it costs as much as four to five times to fix an issue on a property compared to preventing the said problem through a routine, consistent maintenance program. This cost goes beyond monetary value if you also consider the inconvenience that tenants have to put up with as the time-consuming repairs are conducted. There are few and straightforward principles of preventing problems on a property and general property maintenance. The most important principle is that owners must schedule routine, consistent, and frequent inspections of the property. These inspections must be followed up with immediate and appropriate interventions that resolve any issues discovered during the inspection. The problems that could cause the costliest repairs should have the most attention and be fixed first. A seasonal inspection and maintenance checklist could be valuable to address climate-related problems, where and how they affect the property integrity, and the remedies or repairs to resolve them. Keeping track of these maintenance details will help the owner keep track of repairs and generate data that can be used to develop a reserve fund for future repairs and replacement. Finally, if you are a property owner or manager, consider implementing a system of communication (enlist tenants and show them how to contact you) and use an automated ticketing system to help keep track of repairs, flag priority items, and follow-up after repairs. Such an automated system can prove useful in extending the life of your property by providing actionable data and keeping issues from “falling through the cracks”. Have questions about your property maintenance? Give C & L Services a call at 732-886-1940 for a free consultation. We’re experts at helping property owners prevent issues and keep costs down with their property maintenance.